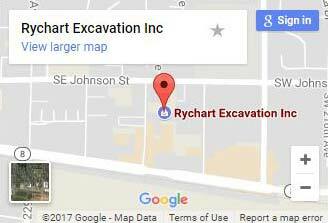 Rychart Excavation, Inc. performs sewer hookups, pipe replacements if damaged by tree roots, repairs, and new installations. We have all the tools and equipment to do any type of underground sanitary and sewer jobs. From hook-ups and abandonment of septic systems to deep sewer mains, laterals and manholes. Additionally, we also install, remove and repair any and all underground utilities. Storm Detention, Grading, Underground Storage, Water Quality Manholes and Structures. We Install Water Mains And Services Up To Your Meter. Fire Lines, Vaults, Fire Hydrants And Apertures. Also known as dry utilities, we do trenching for all gas, cable, and underground PGE utilities. Where “wet” utilities generally bring water from a building, “dry” utilities serve to drive power towards one. In other words, if you want to bring all of the basic necessities into a new or existing structure, the lines first need to be dug and installed. Which is where we come in. Power – Whether it’s gas or electric, we install all conduit, vaults, pedestals and more for virtually any type of building. As a PGE-approved contractor, we fully handle the excavation and installation of all utilities as well as directly coordinate the operation with PGE so you don’t have to. Telephone & Communications – We install conduit & pedestals for phone, internet, networking and more. With over 20 years of excavation expertise, Rychart Excavation, Inc. possesses all the knowledge required to get any structure wired and ready for use.